Readers may recall the gory incidents that took place at Thoothukudi (Tuticorin) in Tamil Nadu in the southern part of India on 22 May, 2018. 13 protesters died on the spot when the police opened fire to disperse an assemblage of thousands of local residents and representatives of civil society groups. 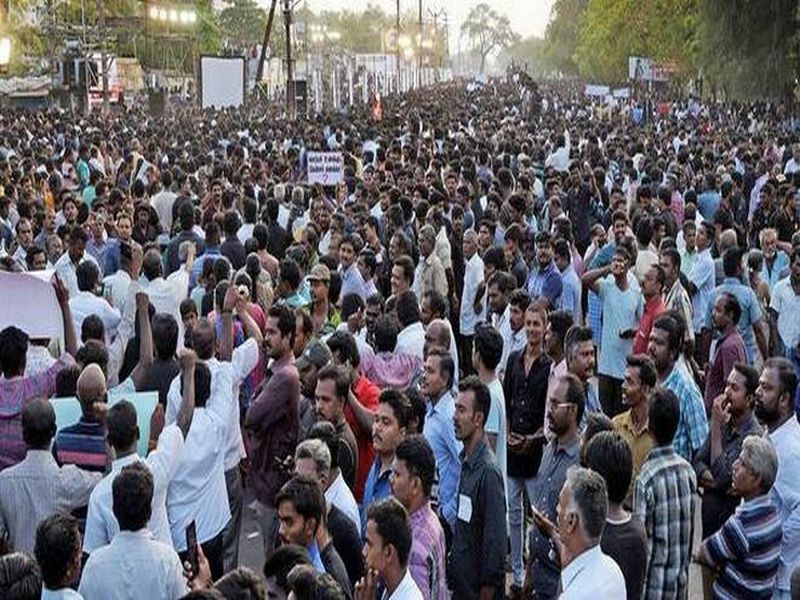 They were protesting against the adverse environmental impact of the industrial operations of Sterlite Copper which runs a copper smelter plant in the area. Accusations against the company have ranged from polluting local water resources to plans for expanding the installed capacity of the plant without the necessary environmental clearances. A ground report published in The Wire recently, mentions the decision taken by Norges Bank a few years ago to not invest funds from Norway's Government Pension Fund Global (GPFG) in Sterlite "due to an unacceptable risk of complicity in current and future severe environmental damage and systematic human rights violations." " The Government Pension Fund Global is saving for future generations in Norway. One day the oil will run out, but the return on the fund will continue to benefit the Norwegian population." GPFG comprises of Norway's earnings from the country's oil wealth. GPFG is said to be worth Norwegian Kroner 8,436 billion which is equal to USD 1,026 billion or INR 69,285 billion. NB claims to have invested these funds in 9,146 companies operating in 72 countries around the world of which 1.4% are listed companies world-wide and 2.4% are listed in Europe alone. According to the Bank, GPFG funds are invested for the long term. Some well known global companies in which GPFG has invested are- Apple Inc., Microsoft, Nestle and Amazon.com, Novartis and Samsung. This is unlike many other portfolio investors who invest in stocks for the short term seeking to make a quick buck with their billions and often end up ruining small investors' fortunes and entire national economies. India and S.E. Asian economies have experienced such predatory investments in the past. Click on the links above to access the reasons for blacklisting these companies. According to the Council on Ethics which guides the investment decisions of GPFG, the case against Vedanta's exclusion is not just its operations in Thoothukudi but also its track record at the refinery near Mettur dam in Tamil Nadu, mining operations in Niyamgiri Odisha, and the refinery in Lanjigarh, Odisha and other operaitons. The decision to blacklist Sterlite and its sister companies was first taken in 2007. Click here for the note prepared by the Council of Ethics recommending exclusion of Vedanta/Sterlite from the GPFG investment universe. Vedanta is said to have advocated with GPFG/NB against the exclusion, but the decision to exclude them was reconfirmed on the basis of the recommendation received from the Council on Ethics in 2013. I could not find this document on the GPFG website. So I did the next best thing. I placed a request for this document on the Norwegian Government's electronic records website. The official recommendation to exclude which is in Norwegian is in the first attachment. An unofficial translation alongside the Norwegian text from the official document is in the 2nd attachment. The controversy continued until 2017. Related correspondence has been reproduced on the website of Mines and Communities. However I have not been able to find the original documents on the websites of GPFG/NB or the Council on Ethics. GPFG funds are invested in the sister companies of some of those which have been black listed. For example, they have invested in the equities of Reliance Industries Ltd., Reliance Capital Ltd., Reliance Communications Ltd., Tata Consultancy Services, Tata Motors, Tata Steel, Tata Chemicals etc. So it is the business and ethical practices of a specific company that matters to their investment decisions instead of its lineage or umbilical linkage. Some other well known private sector companies in which GPFG funds are invested include- Adani Ports and SEZ, Apollo Hospitals, Apollo Tyres, Arvind Ltd., Ashok Leyland, Asian Paints, Aurobindo Pharma, Bajaj Auto, Bharti Airtel, Biocon, Bluedart Express, Britannia Industries, Cadila Healthcare, Chennai Superkings Cricket Ltd., Cipla Ltd., Coffee Day, Colgate Palmolive India Ltd., Dabur India, Dr. Reddy's Laboratories, Godrej Industries, Grasim Industries, DishTV, Idea Cellular, India Bulls, Infosys Ltd., JSW Steel, Larsen & Toubro Ltd., Mahindra Holidays & Resorts Ltd., Mahindra & Mahindra Ltd., Maruti Suzuki Ltd., Monsanto India Ltd. Muthoot Finance Ltd., Piramal Enterprises, Raymond Ltd., Sun Pharmaceutical Industries Ltd., Thermax Ltd., Thomas Cook India Ltd., Titan Co. Ltd., TV18 Broadcast Ltd., United Breweries Ltd., Voltas, Wipro and Zee Entertainment Enterprises Ltd. to name a few (phew!). Please click on India's outline on GPFG's global investment map to view the complete list of companies, the value of investment in each company in NOK and USD terms, the ownership and voting rights in each company. GPFG's investment in Indian equities was valued at NOK 66.3 billion or USD 8.1 billion at the end of 2017. Additionally, GPFG has invested in fixed income schemes in India in both the private and public sector entities such as Reliance Industries- USD 94.4 million and Rural Electrification Corporation Ltd - USD 4.8 million. GPFG has invested USD 3.4 billion in Government of India bonds as well. Many activists working at the community level to demand accountability for the adverse impact of the operations of domestic and multi national corporations (MNCs) on human rights, public health and environment would do well to think of investors like GPFG/NB as a target for advocacy. For example, in 2006, the Council on Ethics recommended that Monsanto Co. be excluded from its investment universe of GPFG for using child labour in the field of hybrid cotton seeds production in India. Click here to read the recommendaiton. However, the Norwegian Ministry of Finance decided to engage with Monsanto for a limited period through Norges Bank to use its ownership rights to try and get the company to reduce dependence on child labour. In 2008, the Council on Ethics found that Monsanto had indeed taken tangible steps in this direction and that active ownership through GPFG had paid off unlike any other investor in the company who had paid serious attention to this issue. So the Council on Ethics decided to withdraw its recommendation to exclude Monsanto from the GPFG investment universe. However, according to a 2008 press release published on its website the Council and Norges Bank continue to monitor Monsanto. This case study shows that environmental and human rights activists can send to the Council on Ethics, evidence of violation of human rights, severe environmental damage or corruption relating to any company operating in India in which NB has invested GPFG funds. When domestic remedies are slow or ineffective, this strategy could be explored. Click here for the contact details of GPFG's Council on Ethics. Norwegian Government is one of the best examples of how transparent a government and its agencies can be if there is political will and a culture of openness that pervades the bureaucracy. S. Asian and African countries that have enacted laws to guarantee access to information could do well by emulating the good practices adopted by Norway. Their Government volunteers a wealth of information about its working in the public domain. In October 2013, the Norwegian Ministry of Finance a recommendation from the Council on Ethics to exclude Sesa Sterlite from the GPFG's investment universe The title and date of receipt of this document are listed on Norwegian Government's latest version of their Electronic Records Database- e-Innsyn. Until recently it used to be called OEP. Any person may access this database of electronic records held by the national and local governments in Norway and place an order for them just like one would buy a book or any other product from Amazon.com. If the document is not covered by any exemption under Norway's access to information law, it will be delivered free of charge by email. I had used this facility in the past and obtained documents relating to India. This time I sought a copy of the 2013 document that the Council of Ethics sent to the Finance Ministry. The Norwegian Ministry of Finance emailed me the document within less than 24 hours of making the online request (see 1st and 3rd attachment). Section 4(1)(b) of India's Right to Information Act, 2005 requires the Central and the State Governments to create such databases of hard copy and electronic records they hold in custody. Despite making tall claims about being an IT giant to anyone who is willing to listen, they have not deployed this technology to create a database like e-Innsyn. It does not cost the heaven and earth to create one. It does not have to be done in one day either. What is needed is a commitment to comply with a statutory obligation of proactive disclosure, a phased plan of action and some techies to create and maintain such a database. The quick research behind this email alert was inspired by the piece published on The Wire about the aftermath of the Thoothukudi tragedy. Yes, I read articles published on this digital media platform, irrespective of the derision with which some "the country wants to know" choirboys of the establishment refer to it. Articles such as The Wire's give real food for thought and guide towards action. Shouting matches of the kind telecast on several 24x7 private satellite TV news channels are best relegated to stadiums and fish markets. All facts mentioned in this piece are already in the public domain. Views expressed are personal.